Thirty miles east of Vancouver in the North Fraser River Valley, you'll find hidden corners of tranquillity: dairy farms, nurseries, cranberry and blueberry fields on a giant flood plain protected by dikes and surrounded by farmland. I love Vancouver’s city vibe, but on a recent visit to British Columbia, my husband and I decided to bypass the urban adventures for a weekend in the Canadian countryside. We didn’t have to go far. Thirty miles east of Vancouver in the North Fraser River Valley, you’ll find suburbs Pitt Meadows and Maple Ridge. 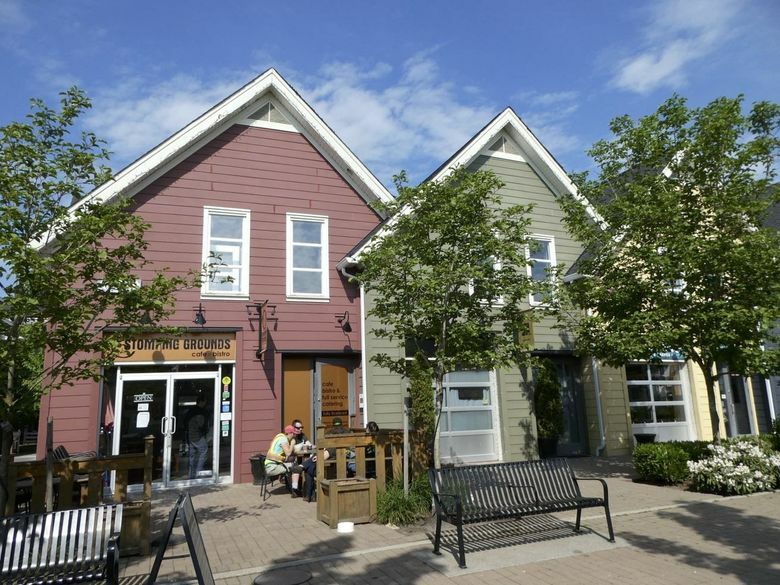 They’re a mishmash of housing developments and strip malls — and for those in the know, hidden corners of tranquillity in metro Vancouver, nestled between the Pitt, Alouette and Fraser Rivers in the foothills of the Golden Ears mountains. Here you’ll find dairy farms, nurseries, cranberry and blueberry fields on a giant flood plain protected by dikes — those long stretches of raised earthen mounds — and surrounded by farmland. Built by Dutch settlers in the 1950s as a method of flood control, the dikes form an interconnected system of walking and bicycling trails, where waterfalls and wildlife habitats make an overnight stay worthwhile. We scored a garden-suite Airbnb attached to a century-old Maple Ridge home once used by a Vancouver family as a summer retreat — a bargain at $65 a night. With the better part of two days to explore, it made sense to bookend a long bike ride around the dikes with hikes in nearby regional parks, complete with pit stops at a historic pub, a local cheesemonger, and Peruvian and Taiwanese bistros. The hike: This dog-friendly wilderness area and wildlife habitat on the banks of the Pitt River boasts views of snow-capped Golden Ears peaks and a dike system surrounded by wetland bog and marsh areas. With a few hours of afternoon light left before sunset, we opted for a four-mile walk around the Katzie Marsh Loop, a trail that begins along the Pitt River dike, a flat, wide path of packed gravel, flanked on one side by the Pitt River and the other by a marsh filled with watershields, rooted plants similar to water lilies (but smaller) that float on the water’s surface. From a wooden observation tower, we looked for some of the 200-plus species of birds sighted in the park, and spotted herons, ducks, geese and osprey. A right turn led us to the Swan dike trail, a grassy path bordered by water, then onto the Nature trail, a narrow, wooded route dotted with cattails, pond weeds and blackberry bushes. We’d heard that someone had spotted a bear here earlier, but saw only a few lone kayakers. Pit stop: At the Billy Miner Alehouse Café on the Fraser River, grab a stool on the front porch or a high-back upholstered chair near the wood stove, and return to a time when train heists were common along the railroad tracks running past the front door. Once a bank and shelter for war vets, the pub is named for gentleman bandit Billy Miner, a Robin Hood figure who targeted companies like the Canadian Pacific Railway. Today, it’s commuters riding the express trains from Vancouver who stop here after work. We paired pints of Three Bears Breakfast Stout from Langley, B.C.’s Trading Post Brewing with a wood-fired pizza piled with pulled pork, roasted sweet potatoes, mango chutney and pineapple. The ride: With about 40 miles of interconnected bike trails, the Maple Ridge-Pitt Meadows dike system offers many choices for rides along flat, mostly hard-packed gravel paths. Let’s Go Biking, a website dedicated to easy rides around metro Vancouver, outlines access points, directions and sights on printable maps. With most of the day to explore, we followed the Ridge Meadows Circle route for a 20-mile ride along all three rivers, mostly on dikes and a few roads with dedicated bike lanes. Starting at Osprey Village, a planned community in Pitt Meadows across from a shoreline park, we pedaled first along the banks of the Fraser, then a narrow path in the forested Pitt River Greenway. The trail widened again as we left the woods, passing a small airport, a cedar mill, blueberry farms and cranberry bogs. If I had time to do only part of this trail, it would be the last leg along the south side of the Alouette, the most peaceful of the three rivers, with views of Golden Ears in the late afternoon light. Pit stops: Begin or end a dikes ride at Stomping Grounds cafe for Peruvian fare, or Jia Plus, a Taiwanese cafe in Osprey Village. Stomping Grounds offers brunch on weekends, plus breakfast sandwiches and panini perfect for a picnic lunch. Owner Anahi English’s specialty is budin de pan, a Peruvian bread pudding made with raisins, cream, cranberries and eggs, all drizzled with caramel. Jia Plus offers cold Taiwanese milk teas, smoothies and nondairy drinks, and a small menu of hot dishes including wonton soup and ginger pork in a cozy cafe decorated with local art. 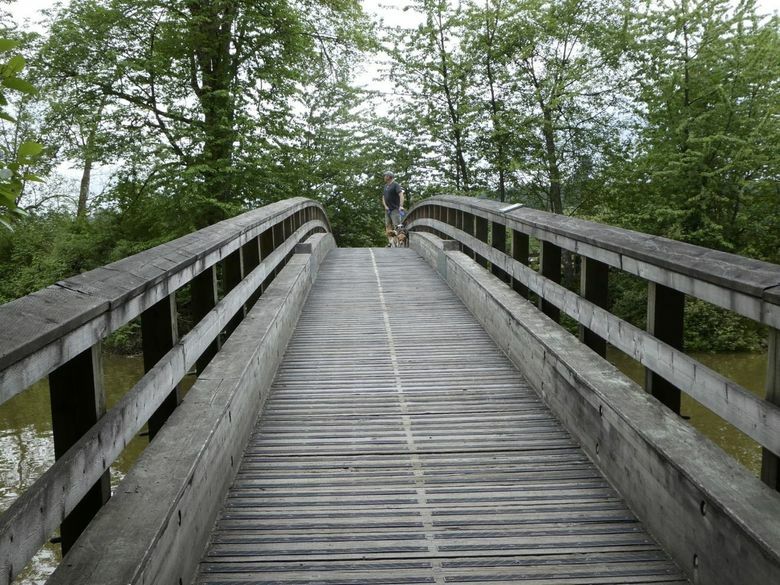 The hikes: Easy walks through a coastal rain forest, waterfalls and sandstone cliffs await visitors at this wilderness park along the Kanaka Creek, just five miles from downtown Maple Ridge. With only a few hours left the morning we were headed back to Seattle, we decided to save larger Golden Ears Provincial Park for another time, and explore two short trails in this scenic regional park. Interpretive signs along a riverfront nature trail explain how logs were once moved off rail cars and onto booms (rafts) for transport down the Fraser to local sawmills. A wooden footbridge crosses Kanaka Creek, where the trail leads to picnic areas with peaceful water views. An upper canyon trail in the Cliff Falls area follows sandstone canyons with wooden footbridges and views of waterfalls. Wide paths and wooden steps in steeper areas make it a family-friendly trail popular with dog-walkers and parents packing babies in front pouches. 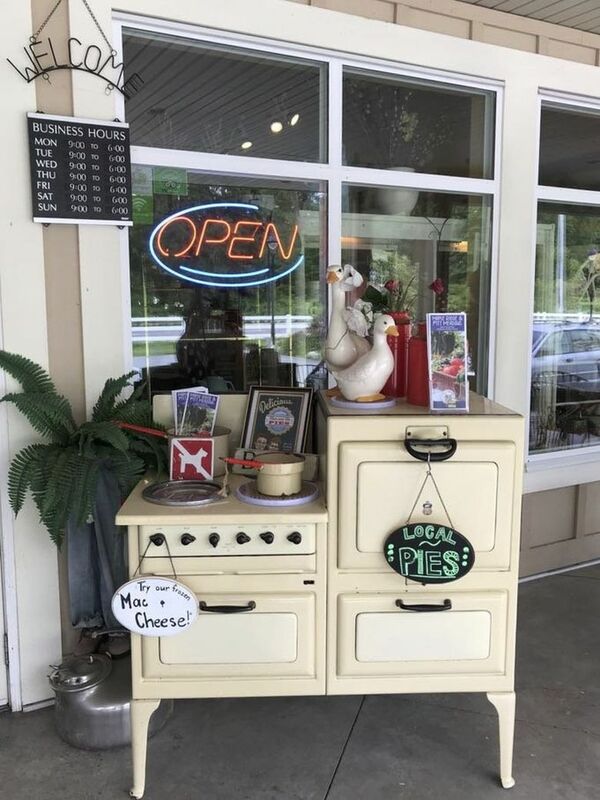 Pit stop: Stop by Golden Ears Cheesecrafters to watch cheeses, curds and butter being made with milk from the dairy next door run by two Maple Ridge sisters. “Everything you see in this case was made right here,” a woman behind the counter told me, offering samples of smoked Gouda and Jersey blue. We came before our hike for coffee and a breakfast flatbread — eggs, cheese, tomatoes and bacon with a drizzle of balsamic — then returned later for cheese and a raspberry-apple pie. Where: Pitt Meadows and Maple Ridge are 30 miles east of Vancouver in the North Fraser Valley. From Vancouver, head east on Highway 1 (the Trans Canada Highway) to Highway 7, which becomes the Lougheed Highway. 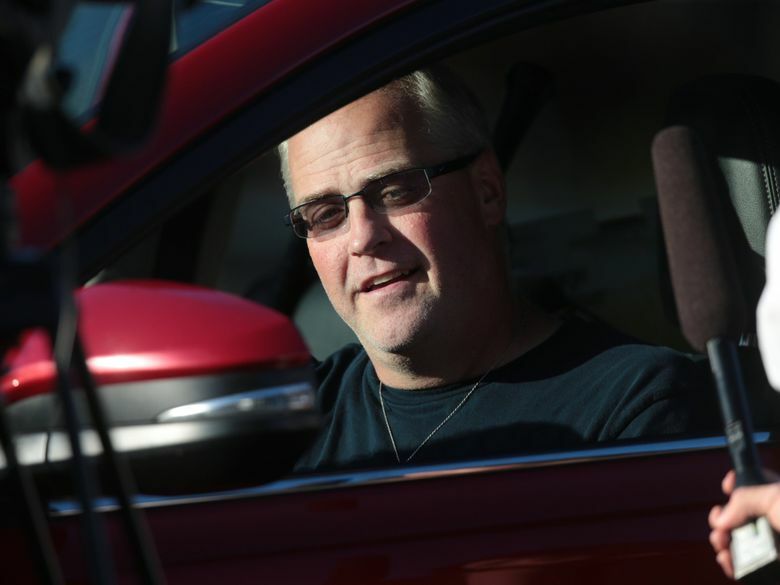 From Seattle, plan on about 2.5 hours of driving, not including border wait times, for the 130-mile trip via Interstate 5, BC-15 North and Golden Ears Way. Tourism information: See the Maple Ride & Pitt Meadows Community and Business Resource and Destination British Columbia. Trail maps: See Let’s Go Biking and AllTrails for routes along the dike trails. The City of Pitt Meadows also publishes a map of bike routes. Lodging: Chain hotels along the Lougheed Highway (Highway 7). Airbnb offers the best option for bed-and-breakfast-style accommodations. 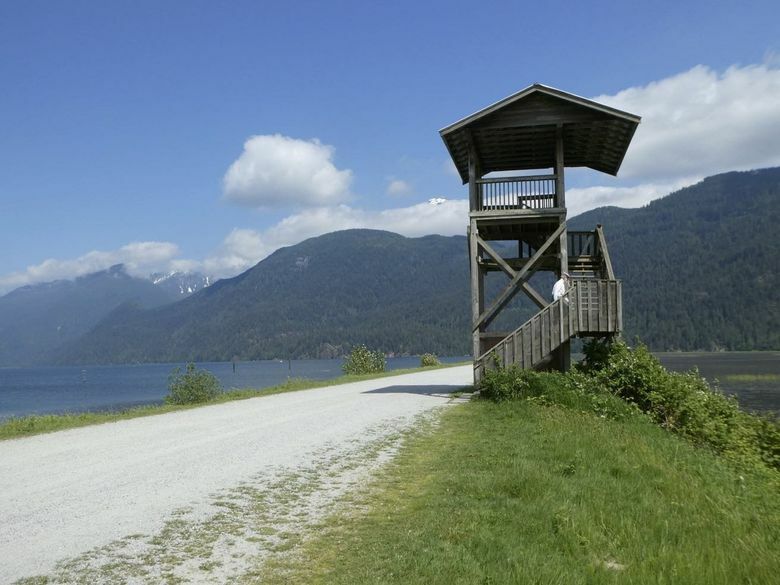 Golden Ears Provincial Park has three campgrounds. Billy Miner Alehouse Café, 22355 River Rd., Maple Ridge, 604-467-6002, breakfast, lunch and dinner, with a kid-friendly cafe next door.